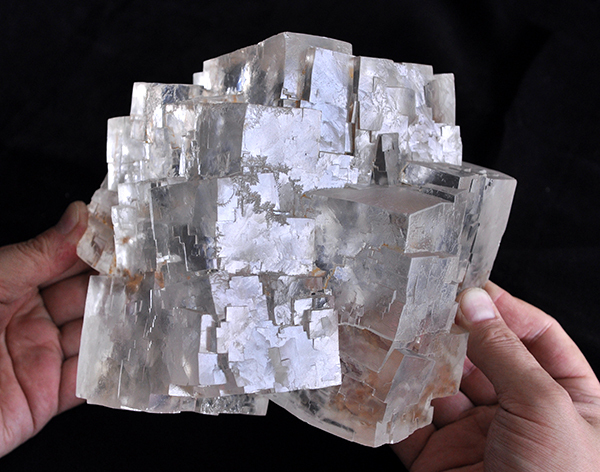 Poland is famous for excellent halite specimens, including “museum” specimens consisting of clusters of giant cubic crystals. Such specimens were found in a mine known throughout the world: the Wieliczka mine. The majority of Wieliczka specimens were collected in “Austrian times” (i.e. Poland had been partitioned, and before World War I this part of the country was ruled by the Austrians) and in the period between the two world wars. Judging Polish halites in general simply by looking at a few specimens in a few museums, one might conclude that all halites from Poland look alike – but of course this is not true. In Poland there are at least five noteworthy localities for halite specimens. Interestingly, the best of these specimens do not come from the Wieliczka mine but rather from the Solno mine at Inowrocław, which lies about 500 km north-northwest of Wieliczka. The deposits in the Cracow region (Wieliczka and Bochnia) date from the Miocene (15 million years ago), but the deposit at Inowrocław, economically more important and productive of better specimens, dates to the Upper Permian (in Europe called the Zechsteinian: 290-250 million years ago). Thus, even though all salt deposits in Poland are of similar origin – they are evaporates formed in the wakes of retreating seas – these two deposits are of much different ages and formed from two different seas. The Solno mine is unknown to most collectors, as its fame has been utterly overshadowed by that of the Wieliczka mine. Unfortunately, it was closed in the 1980s, and since then it has not produced any new specimens. However, in its time it produced numerous, very high-quality specimens of halite. 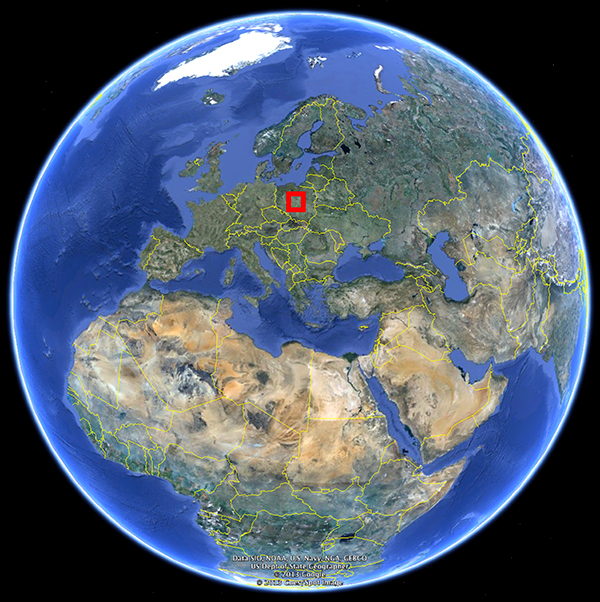 Satellite photo of Earth with the area described below. 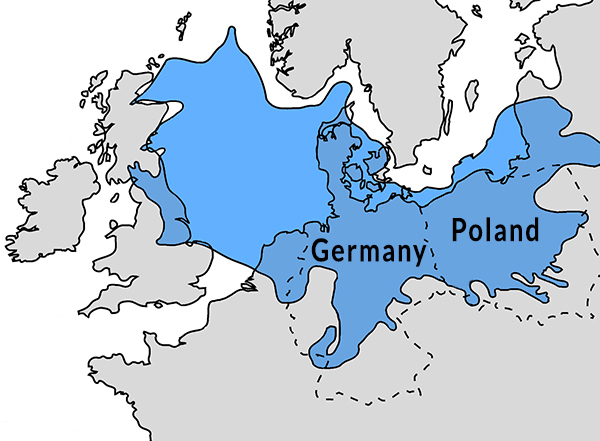 During the Upper Permian period a huge basin, part of the Central European Basin, covered all of what is now Poland. This basin was flooded by repeated incursions of the Zechstein Sea, of which a characteristic feature was the occurrence of extensive shallow zones responsive to cyclic changes in sea level. During periods of lower sea level there was extensive evaporation in the shallow zones, forming large deposits of halite and of potassium and magnesium salts, with interbedded layers of clays and anhydrite: these characteristic evaporite sequences are called cyclothems. Such sequences usually contain layers of minerals with increasing solubility from bottom to top – carbonates, sulphates (anhydrite, gypsum), halite (“rock salt”) and sometimes potassium and magnesium salts. One cyclothem corresponds to one cycle of sea level regression and evaporation. Seven Permian-age cyclothems have been distinguished in central Europe: Werra (Z1), Stassfurt (Z2), Leine (Z3), Aller (Z4), Ohre (Z5), Friesland (Z6) and Fulda (Z7). The largest salt deposits in Europe, mined up to the present day in many localities (mainly in Poland and Germany), belong to one or more of these cyclothems. The deposits of salt that were exploited at Inowrocław are related to cyclothems Z2-Z4. 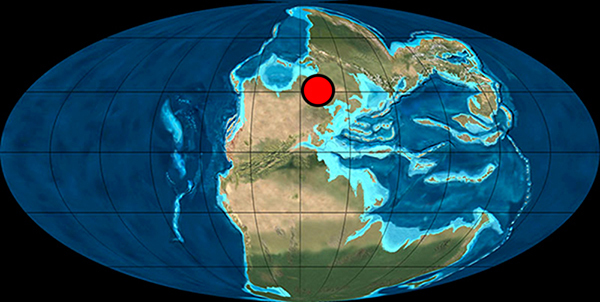 Reconstruction of geography of Earth in the Late Permian (255 Mya) with marked location of the Zechstein sea. 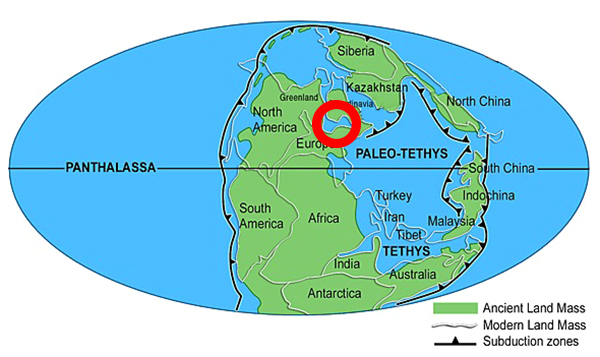 Reconstruction of geography of Earth in the Late Permian (255 Mya) with marked location of the Zechstein sea. Recent geographical unites are shown. Maximal transgression of the Zechstein Sea (blue) on the map of recent Europe, halite deposits formed in the central part of the basin. Large masses of halite undergo a characteristic type of tectonic process: halokinetic movement. As a result of the pressure of surrounding rocks the deposits of salt are stressed and become ductile, to the extent that they begin behaving like “toothpaste squeezed out of a tube”. Because the ductile salt is much lighter than the surrounding rocks, it moves upwards and punctures the layers of overburden, usually using the already existing fault zones. In this way the structures called salt domes come to exist. When the dome gets closer to the surface, gypsum cap rocks are formed by increasingly intensive processes of dissolution followed by re-crystallization of halite and accompanying minerals caused by inflowing groundwater. The gypsum caps protect the salt domes from further weathering. Of course, the halokinetic movements deform the originally horizontal salt layers, folding them strongly. In Poland, salt domes occur along a northwest-southwest line between Szczecin and Łódź; their histories are part of the region’s larger geologic evolution. In this region the largest structure, the Intrapolish Synclinorium, began forming in the late Triassic/early Jurassic. During the Alpine Orogeny of the Palaogen, this structure was inverted, becoming an anticlinorium. The earliest halokinetic movements within the structure are dated to the Triassic, but they peaked during the late Cretaceous/early Paleogen, when the incipient Alpine Orogeny intensified the halokinetic movements, leading to the formation of numerous salt domes. Later, some of these domes were halokinetically squeezed upward over distances to 6 km, puncturing the thick overburden of Mesozoic rocks. Map of central Poland with location of the salt domes, bigger towns and rivers. The salt dome at Inowrocław is one of the shallowest domes in Poland: in some areas its gypsum cap rock lies only a few meters below the surface. The salt itself appears at the depth of 120 to 190 m. The maximum depth of the salt structure is not known: 3000 meter-deep drillings have failed to reach its bottom. It is known that the Upper Permian (Zechstein)-age sediments in this area lie between 4500 and 6000 m below the surface, so presumably the dome began its development at this level. The surface area of the dome measures about 1×2.5 km. The halite reserves still remaining at Inowrocław are estimated at 297.5 million tonnes at a minimum! 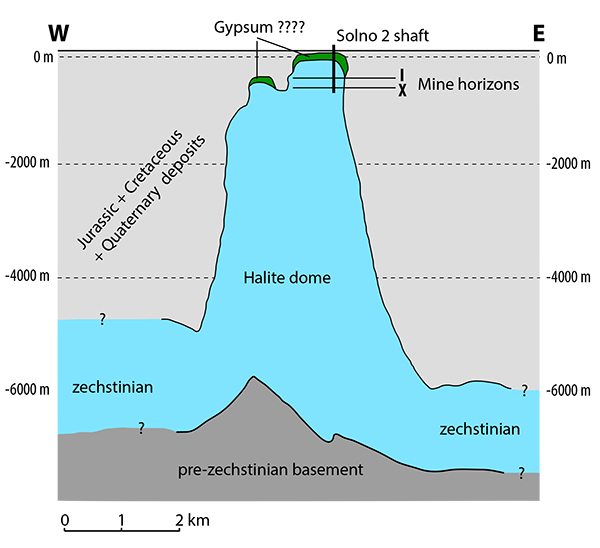 Cross-section of the Inowrocław halite dome. The resources of salt rock in Inowrocław were found quite a long time ago by coincidence. 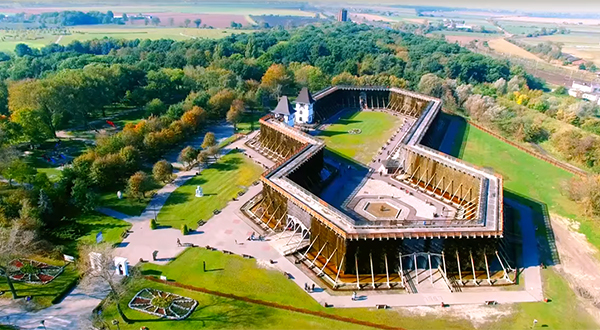 During the search for drinkable water in 1835-1837, pure gypsum was found at the depth of over 13 m, and brine at a depth of 111.5 m.
In 1873 (at that time Poland was partitioned, and the Inowrocław region belonged to Prussia), the Saline Company was established to produce salt from the brine. When Poland regained its independence the company name was changed from “Saline" to “Zupa Solna" (Salt Soup). In 1884, construction of the first shaft of the deep salt mine was initiated; the second shaft was sunk during the period 1891-1894. In 1907, because of the uncontrolled production of salt by the leaching method, a catastrophe occurred and the mine was flooded, with wholesale collapse of the corridors and galleries. For more than 10 years after that, pits formed spontaneously within the city’s borders, sometimes reaching depths of several dozen meters. 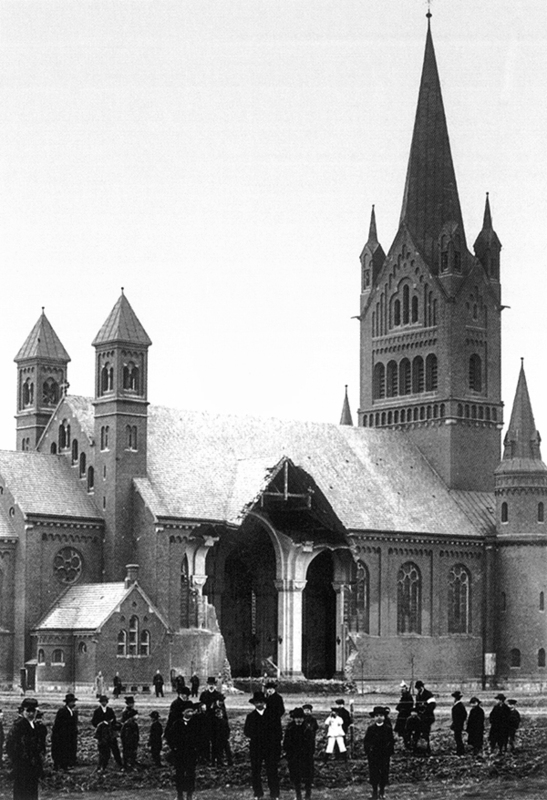 Numerous buildings, including the church, were destroyed. A priest described this accident in the local newspaper Dziennik Kujawski: "On the day of the catastrophe the underground detonations were heard in the morning in the vicinity of church. The catastrophe started in the church at 3.30 PM. Two workers waiting for the service by the north portal noticed the thin but high fountains of water squirting from the lawn not far from the church. Observing them they felt with fear that the earth beneath their feet start elevate. Among the rumble there was a 10 meter high pole of water arising, and just after its subsidence, a big hole in the ground appeared. It expanded coming closer and closer to the walls of the church, absorbing first the granite steps, later stone foundations and the lower parts of church`s walls. The north portal and 20-meter wall stood 4 more hours with no foundation. At 7.30 pm among a horrible roar the third part of the wall collapsed underground, leaving a 400 m2 hole filled with salt water". 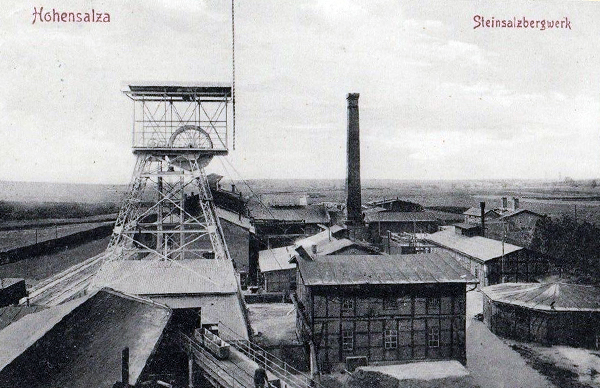 Postcard showing the Solno mine in 1908. Collapsed fragment of the church in Inowrocław as a result of a big sinkhole formation, 1909. 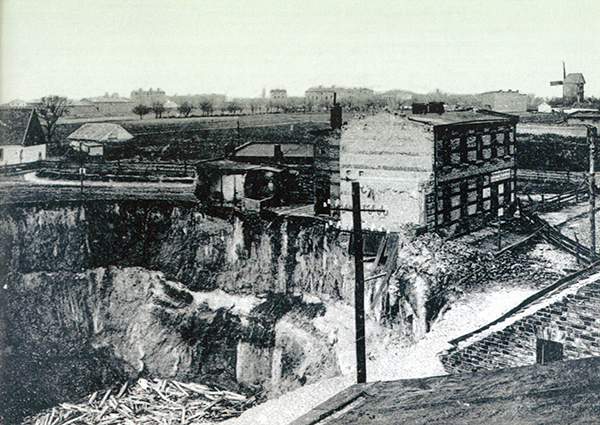 Giant sinkhole in the town of Inowrocław, 1911. It was not until 1924, after much research and evaluation by many experts, that construction started on a new mine, called Solno. Mining commenced in 1932. 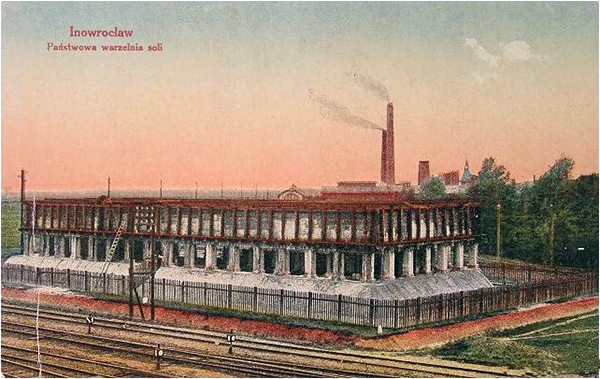 National saltern in Inowrocław, 1920s. After World War II came the biggest boom in the history of salt mining at Inowrocław, and in 1960 a second shaft was sunk. Exploitation of salt proceeded by the so-called “wet method” – a saturated solution of salt in water was obtained by leaching the salt rock, and from this solution, salt, chlorine, soda and soda-related materials were produced. The depths of the shafts reached 600 m and the total length of tunnels reached 240 km; 10 levels of the deposit were exploited. In 1986, because of the very high danger of uncontrolled water inflow, the decision was taken to control the flooding of workings in the “Solno” mine. This process took 8 years. Headframe of the Solno I shaft. 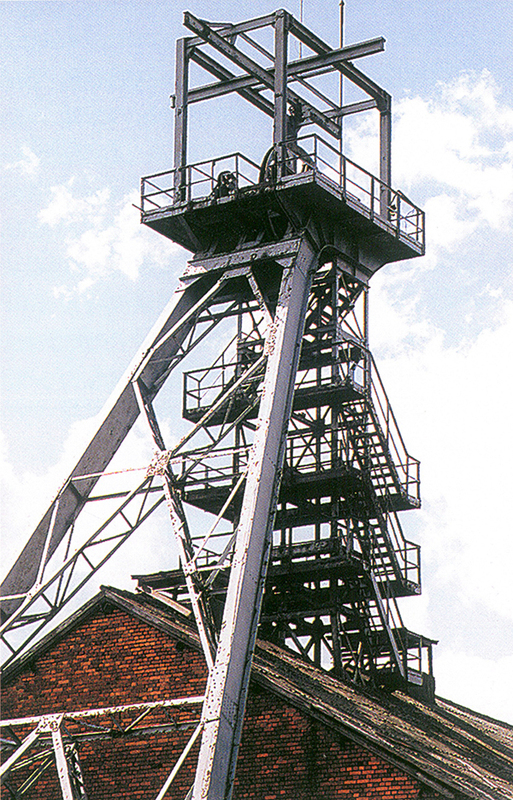 Headframe of the Solno II shaft, 1960s. 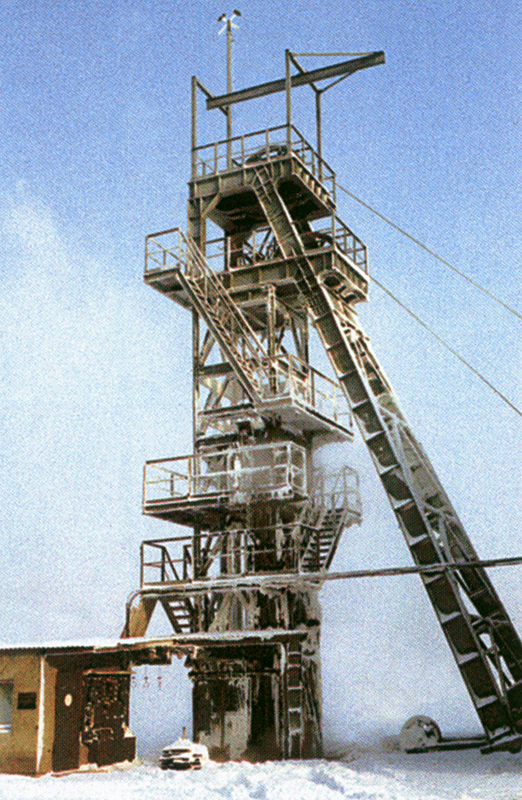 Headframe of the Solno III shaft, 1977. 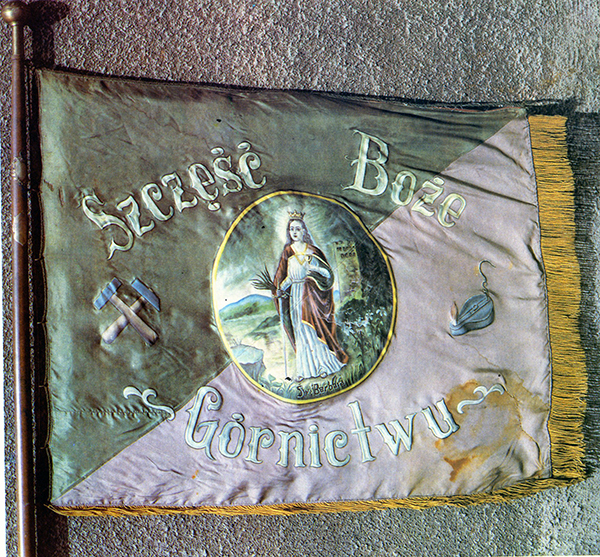 Miners’ flag with the crossed hammer symbol, an old miner’s lamp, and the motto “God Bless Mining”. M. Araszewski photo. Adit in the Solno mine penetrating layered salt deposits. L. Pyszkowski photo. 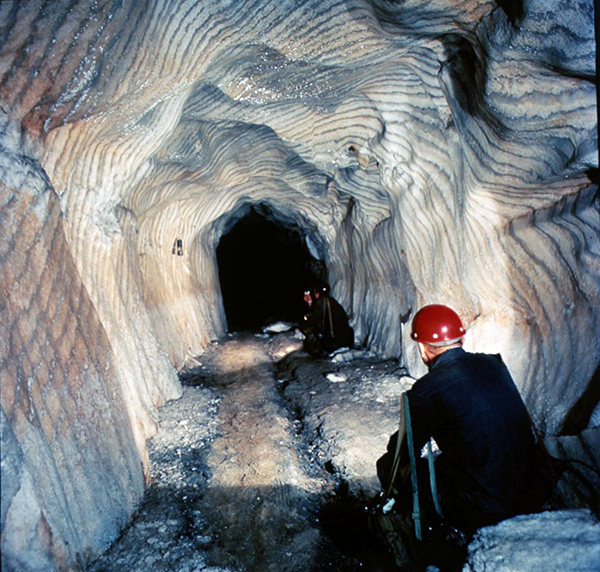 Miners underground in the Solno mine. M. Araszewski photo. The Solno mine was “discovered” as a source of interesting collector-quality specimens in the 1980s. The mine went into liquidation in 1986, and until 1989, by which time it was no longer possible to go down into the mine, it had been visited by collectors only a few times each year. Very few people – mainly collectors “from the outside” – were interested in specimens at that time. The miners who worked in Solno were not interested in collecting and usually did not take the trouble to extract specimens. In the Solno mine (and in many other salt mines in the world), halite crystals of two different origins occur: those which formed originally in the deposit, and those which formed as a result of mining activity. 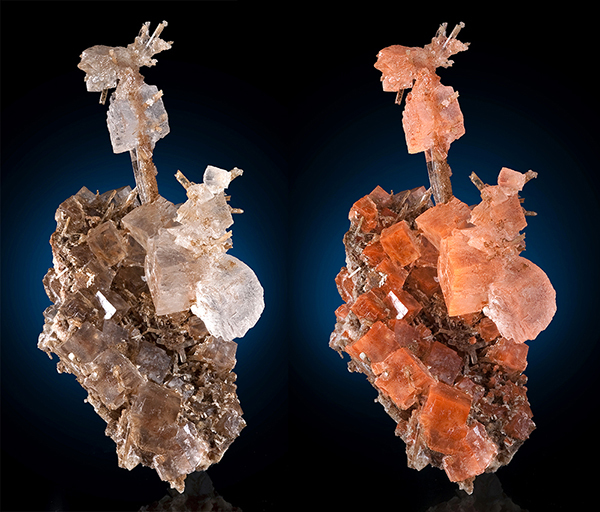 Solno mine specimens of these two respective types are informally but misleadingly called “primary” and “secondary” halite; however, in this article the latter type will be called by its proper name: “post-mining” halite. In the Solno mine there were only three crystal chambers for which information survives today, although more were probably found. The first of the chambers was mentioned in 1956, in a study concerning potassium-magnesium salts. 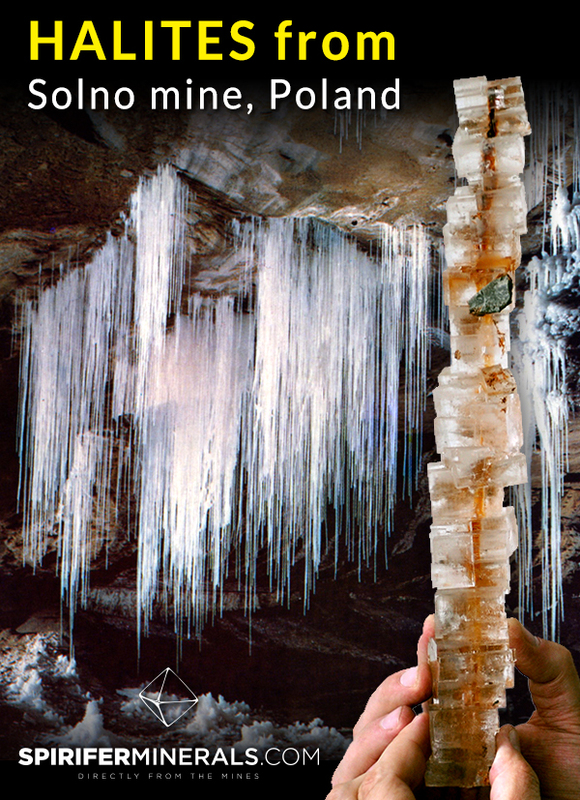 In this study, only one sentence describes the crystal chamber discovered in Stope Number 539 on the IV level of the mine. 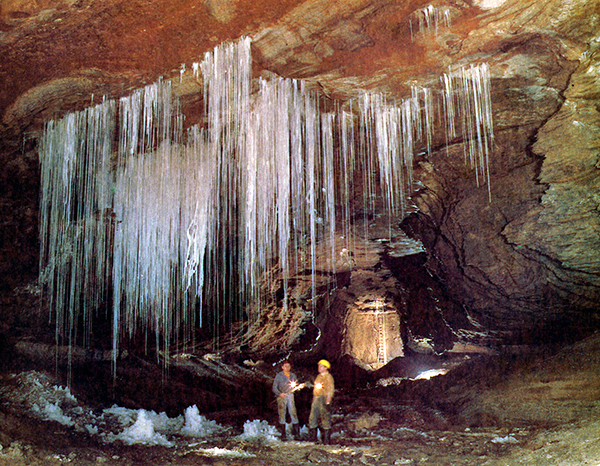 In the accompanying low-quality picture, the chamber is seen to be lined with halite crystals to 30 and 40 cm. Unfortunately the preserved materials do not let us judge the size of the chamber itself. The only known photo of the pocked desribed in 1956 from IV horizon. Unknown author. 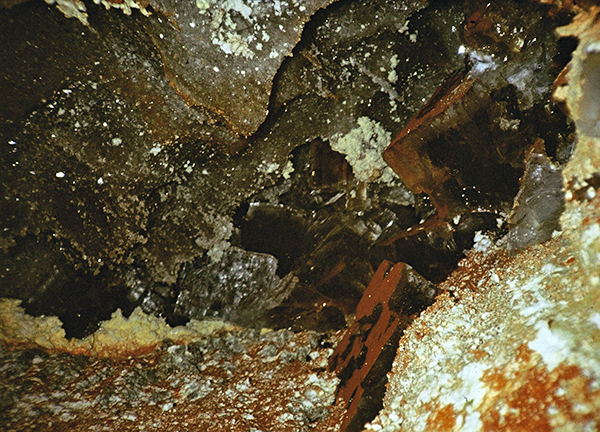 The second chamber was found in the 1980s on II level of the mine. It was a few meters wide and had very large halite crystals – to 70 cm – of a “smoky” color! Probably no specimens were collected from the occurrence. The third chamber, also discovered in the 1980’s, is much better documented. Although, unlike the cavity of the 1950s, it was never described in print, we can reconstruct its shape and size thanks to the efforts of collectors and photographers. 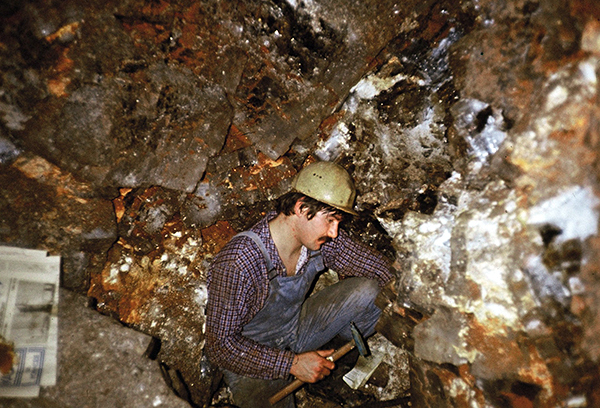 This chamber was the main source of high-quality specimens of Inowrocław halite for most of the 1980s. It was known since 1983 and was visited for the last time in 1989. The main part of the chamber was located on the IX level. 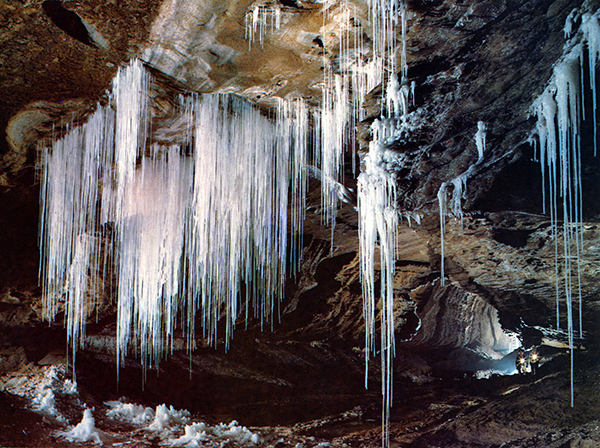 Its height varied from 3 to 5 meters, its width from a few m to 10 m. In a few places on its walls there were bell-shaped hollows in which perfect, sharp halite crystals were intergrown. The length of the chamber reached 25 m, and at one end it curved slightly downward, evolving into a crack in which a thin person could crawl a distance of about 5 m. A related system of cracks stretched up to the VIII level, where a crystal 40 cm on edge was collected. 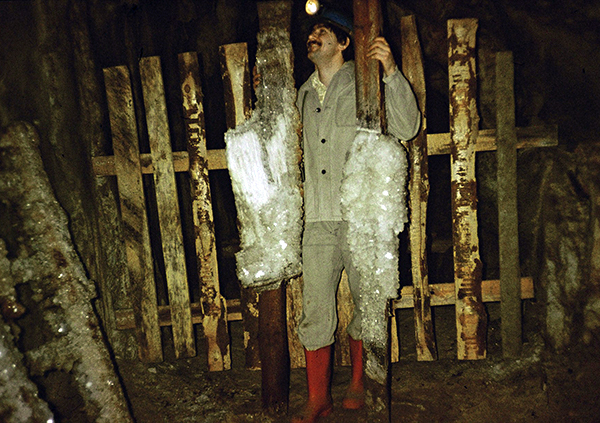 Jacek Wachowiak collecting crystals in the Solno mine. Z. Holzer photo. 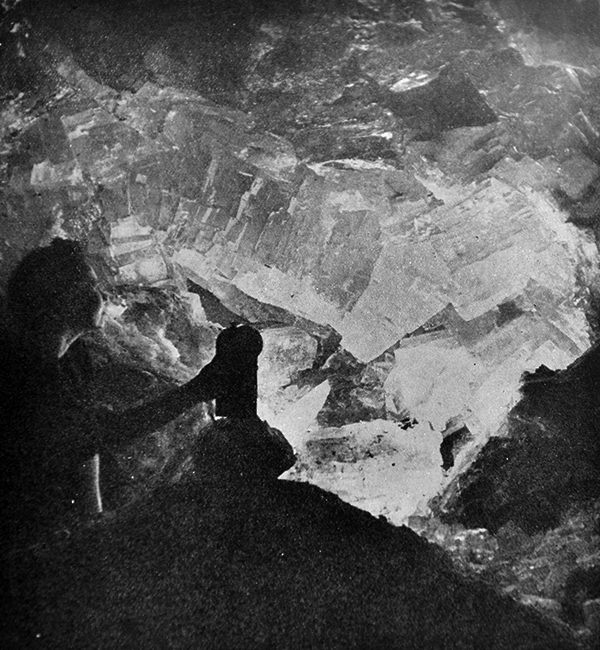 One of the unique photos showing big halite crystals in situ in the crystal chamber located between VIII and IX levels, explored in 1980s. Z. Holzer photo. Such “primary” halite crystals are easy to distinguish from post-mining ones. They usually have much simpler forms, occurring only as cubes, many showing parquet patterns on faces, and are found both isolated and in clusters. Also, most of them are larger than post-mining crystals, and have much higher luster. A characteristic feature of these crystals is their total colorlessness and transparency, although a few are tinted orange by iron oxides. Methane and sulfur inclusions in the crystals have sometimes been observed. All original halites (and some post-mining ones) are strongly fluorescent pink. 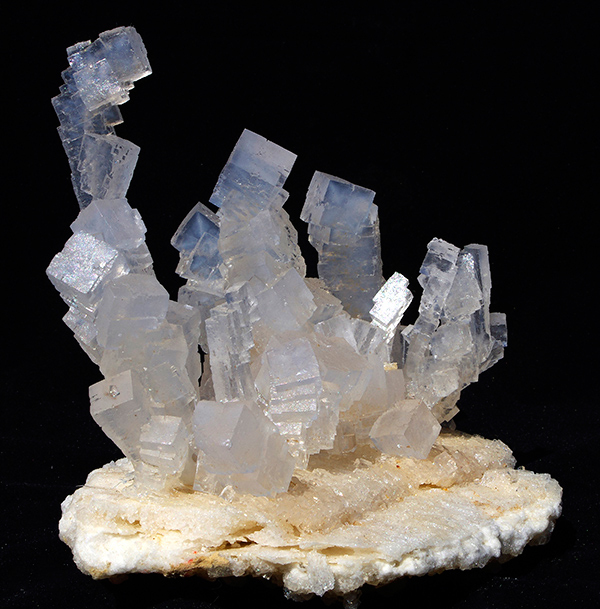 Primary halite crystal cluster, 21 cm. J. Gajowniczek photo. 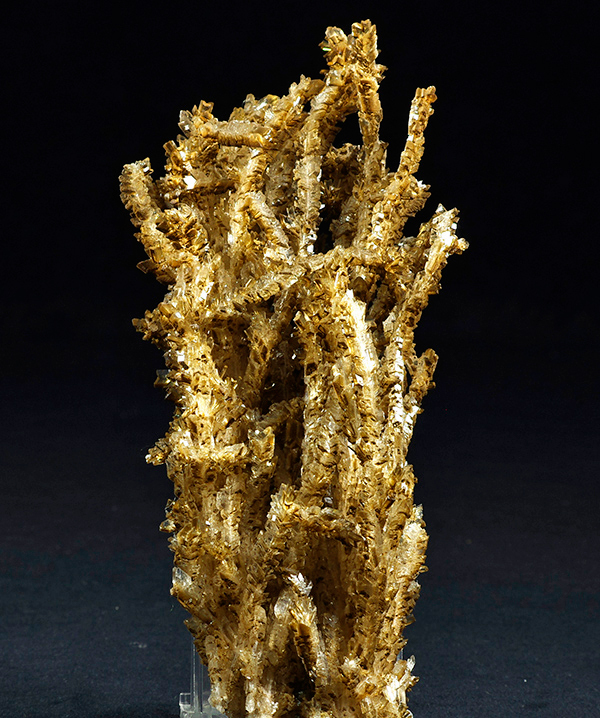 Halite crystals on a matrix of drusy halite, 30 cm tall. J. Elliott/FMI photo. 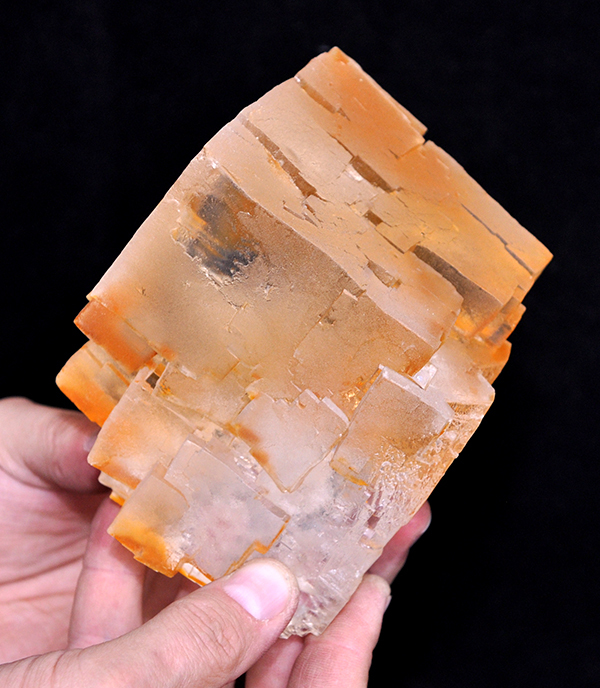 Halite crystal colored by Fe oxides, 15 cm. J. Gajowniczek photo. The same specimen as above. J. Elliott/FMI photo. 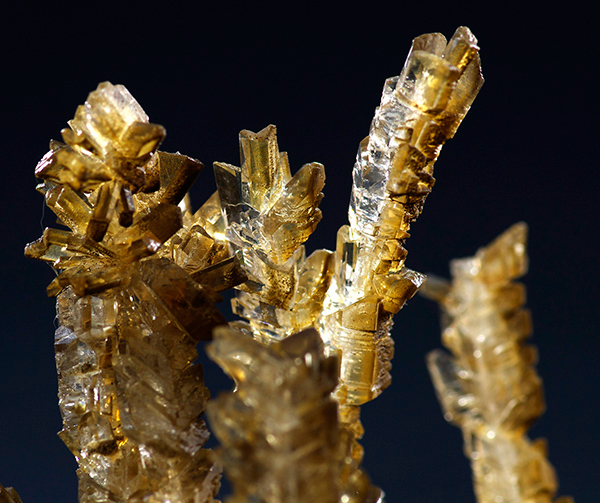 Apart from the crystals just described, other habits of halite from Inowrocław have proven interesting to collectors. Among these are halite specimens with a blue color in zones of varying shades, including some intense blue zones. Such specimens were not found as free-growing crystals but as large, frozen (enclosed) and cleaved ones. 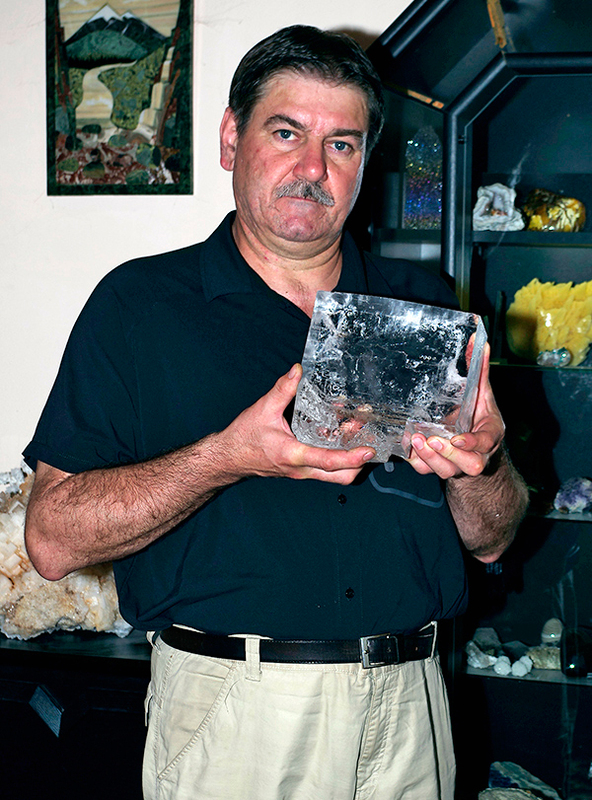 Jacek Wachowiak (recent photo) with a large cleavage of clear halite. A. Bulicz photo. Not highly valued by collectors but surely interesting from a genetic point of view are the fibrous halites forming peculiar bunches of hairs on fissure surfaces, the lengths of the hairs reaching a few centimeters. It is thought that this type of halite developed in the Quaternary, when there was tectonic relaxation after continental glaciation ended and a number of cracks slowly opened; the fibrous halites formed in those cracks. 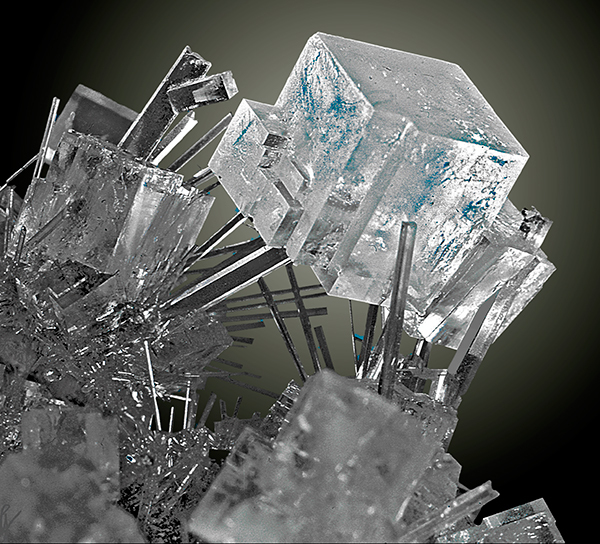 The second type of halite occurring in Inowrocław is the post-mining crystals, with origins connected to mining activity. With the “wet” exploitation method, large chambers were leached in the salt deposits. After the mine was abandoned the halite recrystallized from the brine, producing huge numbers of crystals in the chambers. Because this process was very quick, the crystals resulting from it are rather small and are much less transparent than primary crystals. Most are white, with low luster, although some developed on colorful matrix of pink or red salts. 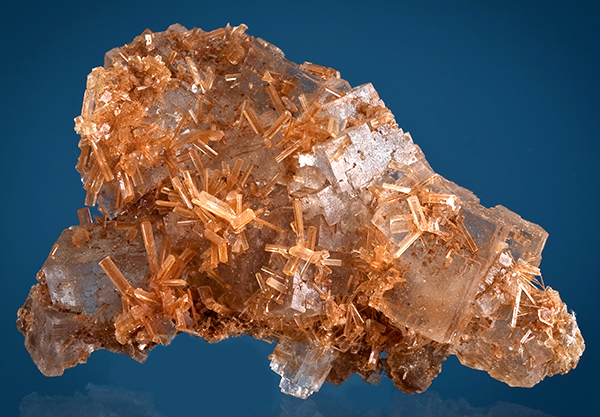 In some cases the post-mining halite is associated with gypsum crystals. 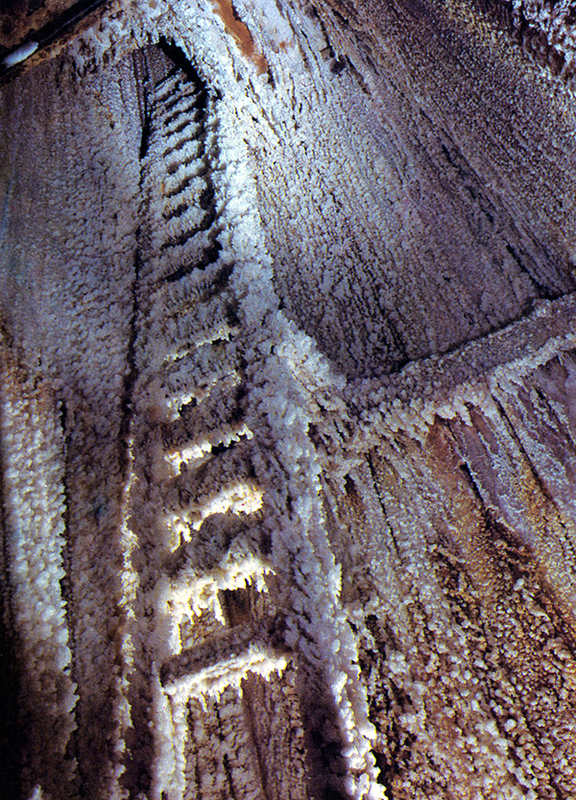 A halite-crystal-covered ladder in the Solno mine. Z. Holzer photo. Jacek Wachowiak with a halite-crystal-covered woods. Z. Holzer photo. Archival photo of specimen of post-mining halite, 1970s. Unknown author. Post-ming halite from Jacek Wachowiak`s collection. A. Bulicz photo. Post-ming halite on fragment of wood from Jacek Wachowiak`s collection. A. Bulicz photo. 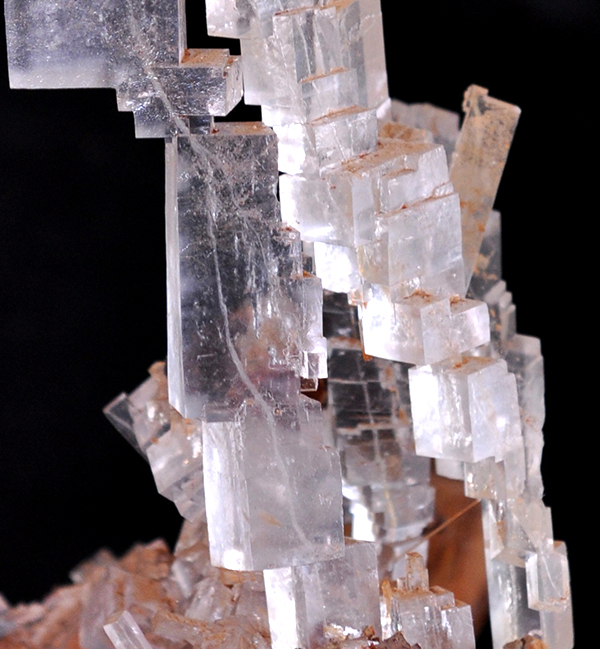 Cluster of stacked halite crystals, 10 cm. K. Ward specimen. J. Budd photos. Halite on gypsum in normal light and in UV light, 13 cm. K. Ward specimen. J. Budd photos. Gypsum on halite, 9.5 cm. K. Ward specimen. J. Budd photo. 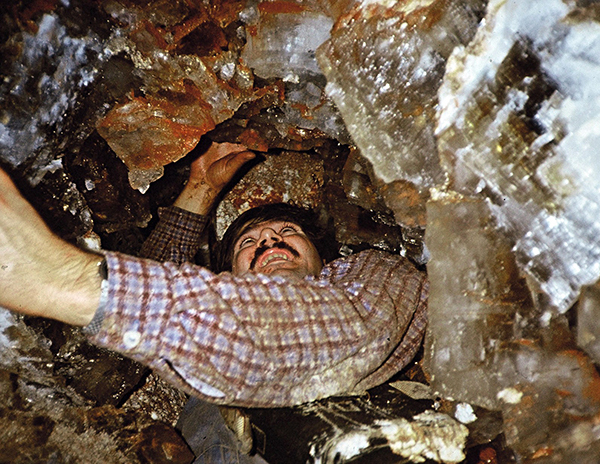 One occurrence of post-mining halite was rediscovered on the IV level in 1988 (see story bellow), as a crystal-lined cavity. It was exceptional in terms of the spectacular forms and habits, and the general quality, of the crystals, which range from simple cubes to distorted cubes so elongated that some of them measure 1×1×7 cm. 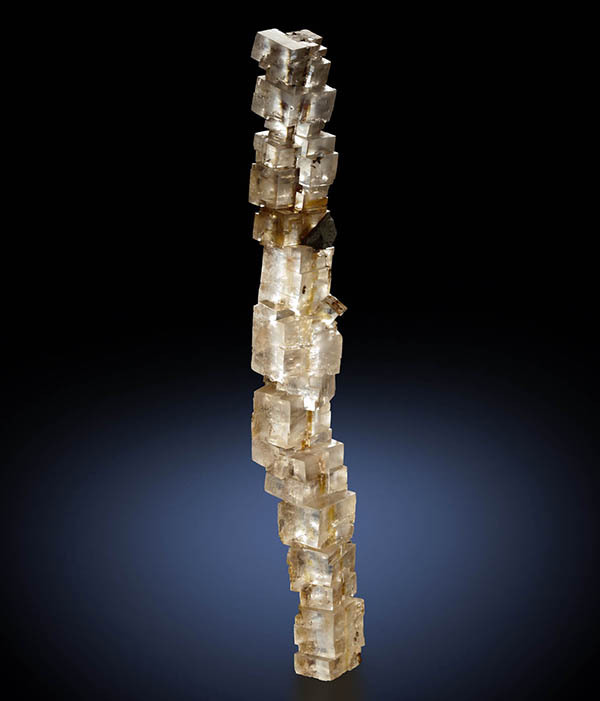 Halite crystal cluster, 14 cm, including elongated, distorted crystals. J. Elliott/FMI photo. 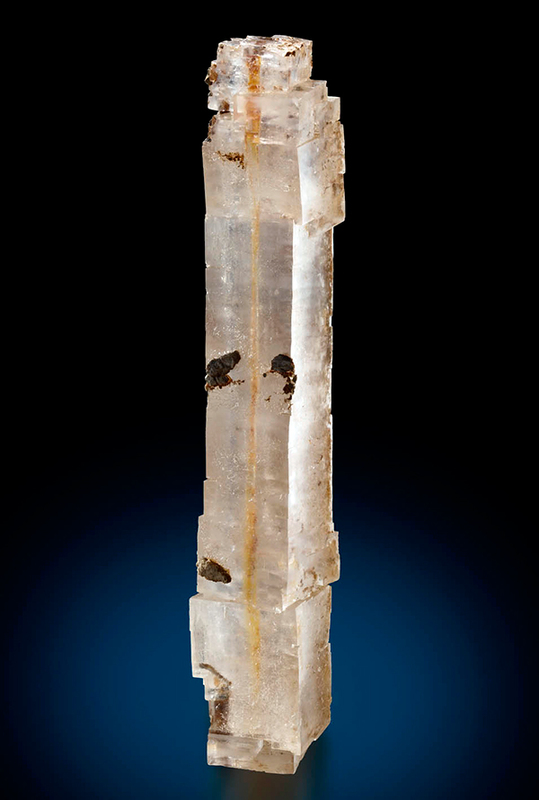 Elongated faden-like halite crystal, 20 cm. J. Elliott/FMI photo. 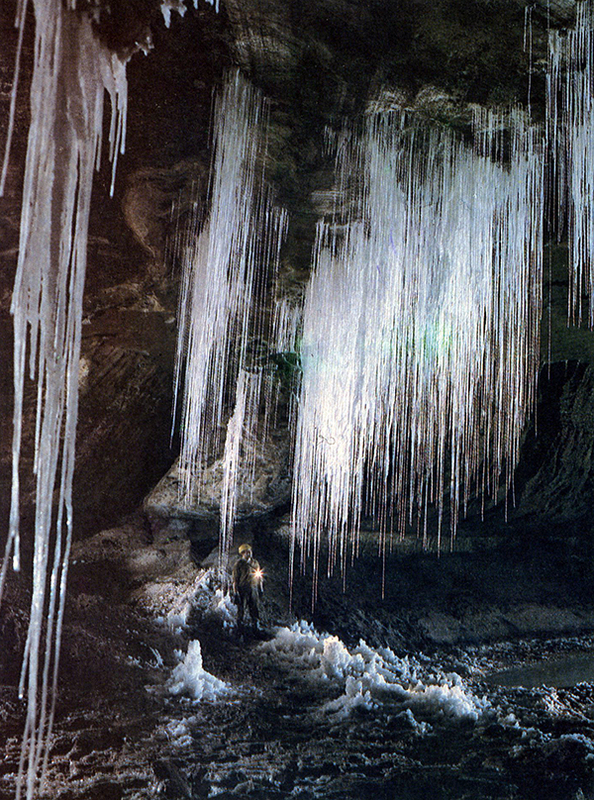 Moreover, the crystals were aggregated in pseudostalactitic growths to 30 cm long. They are quite transparent and often show “fadens” in their central parts. Additionally, some of the clusters are twisted so as to resemble quartz gwindels. A relatively large number of specimens were collected from this chamber. 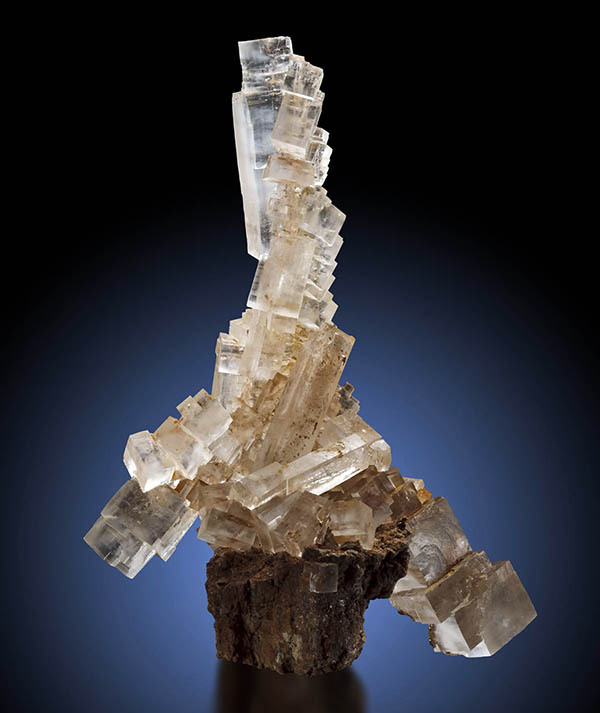 Halite crystal cluster, 22 cm, including elongated, distorted crystals, and well visible faden string. J. Gajowniczek photo. Details of faden string of the specimen shown above. J. Gajowniczek photo. 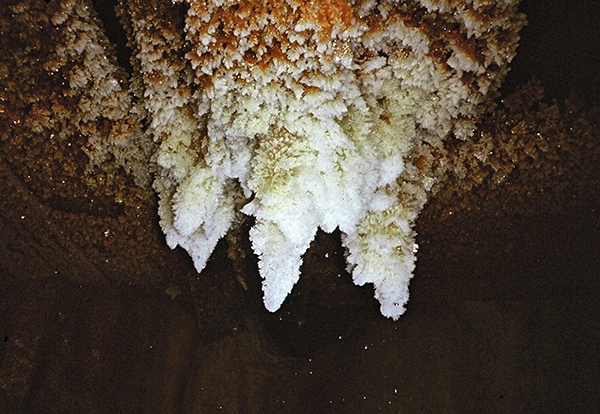 Some post-mining halite formed white, stalactite-like “dripstones”, composed of microcrystalline salt, reaching a few meters long. These are definitely not collector specimens, but the pseudo-stalactites created beautiful decorations for some of the stopes in the mine. 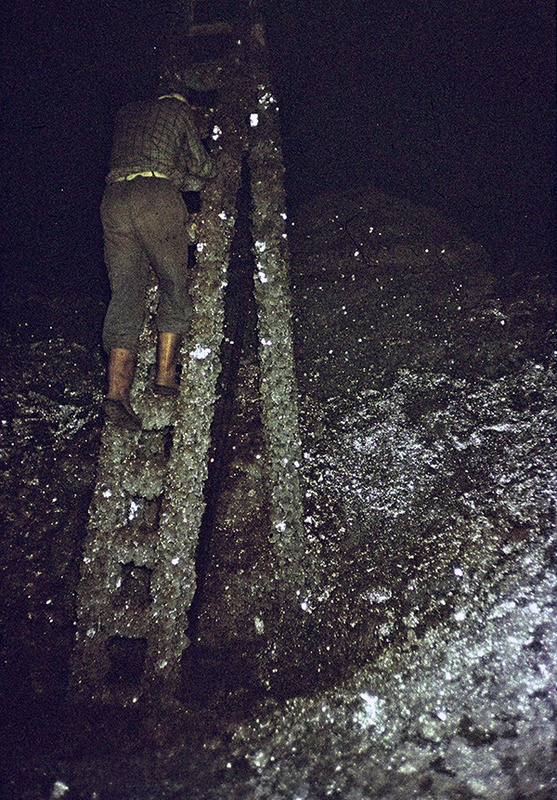 A halite-covered ladder in the Solno mine. M. Araszewski photo. Halite formations on the tunnel ceiling. D. Wachowiak photo. 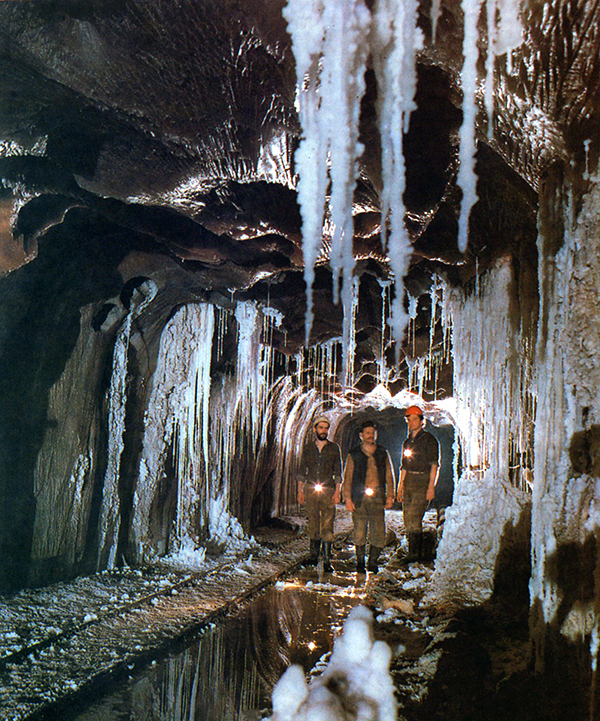 Underground scene in the Solno mine, showing huge halite stalactites. M. Araszewski photo. Halite is an extremely unstable mineral: even a slight increase in humidity is enough to round and dissolve its crystals. The only safe place to store halite specimens is a very dry room without large fluctuations in temperature. Additionally, it is advisable to surround the specimens with hygroscopic silica. Because halite is so “sensitive”, the unfortunate fact is that most specimens collected 30 to 40 years ago probably do not exist anymore, and the number of well-preserved specimens gets lower every year. The large number of fine specimens recovered makes it still possible to find them in old collections and on the mineral market, but such finds are getting more difficult with the passage of time. The high-quality specimens collected in the unusual chamber discovered in 1988 are hardly seen anymore. It is worth noting that Jolanta and Jacek Szczerba (see Sidebar), the only people who collected specimens in the 1988 chamber, kept the best of these for their own collection; they have stored them undisturbed for more than 20 years. A few years ago, when the Szczerbas were away on vacation, their flat was accidently flooded by their neighbors. Fortunately the best specimens were not damaged, but this event had such an impact on Jacek and Jola that they decided to sell the whole collection to the “Spirifer” Geological Society. The specimens were safely kept in the Spirifer collection until 2013 when they were sold to Fine Minerals International as a complete collection. 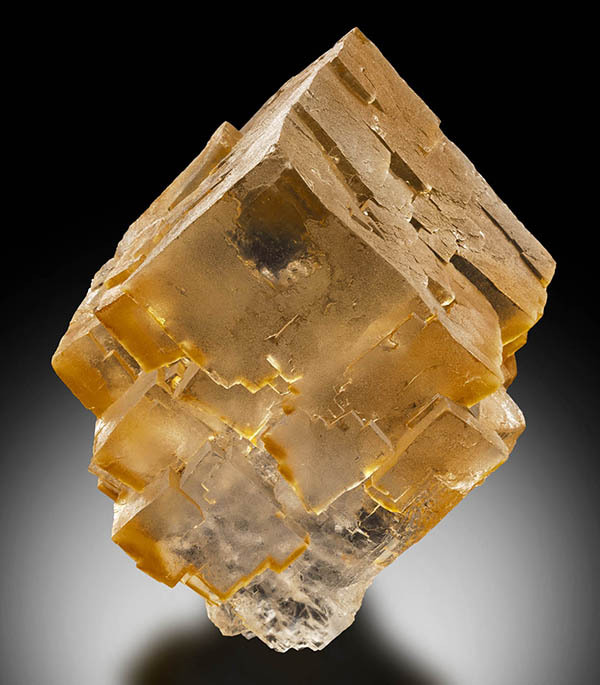 The most interesting mineral from the Solno mine after halite is boracite, which was found in the form of well developed, usually pseudocubic crystals in shades of yellow and green. The size of the crystals reaches to 8 mm. Unfortunately, because of a general lack of interest in this mineral at the time, only a small number of specimens was collected, and even fewer have survived until today. 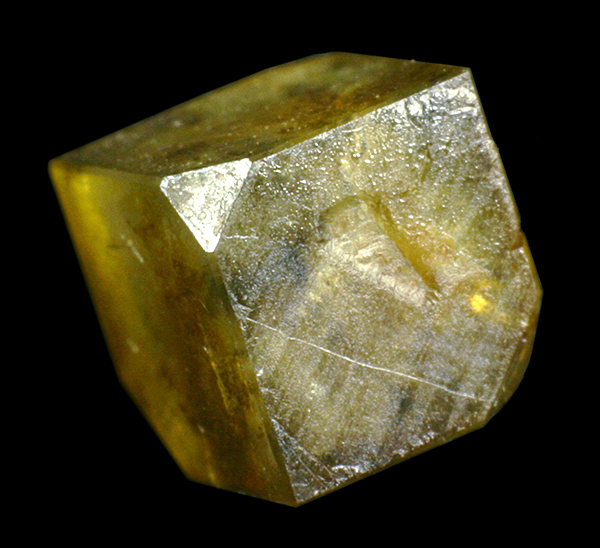 Boracite crystal, 4 mm. E. Szełęg collection and photo. A fairly common mineral in the Solno mine was gypsum (post-mining in origin), which formed crystal “lawns” in the small lakes which filled the old tunnels. This gypsum is colorless but is commonly tinted yellow to red by iron oxides. In some cases it is associated with halite, forming stunning specimens. 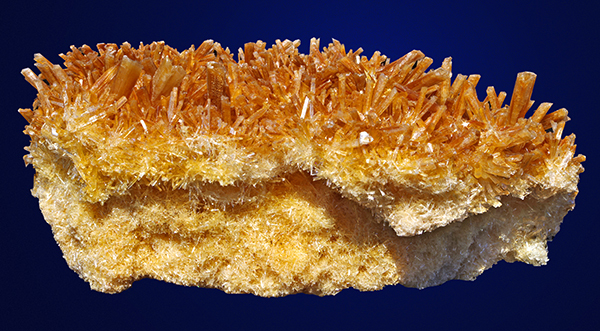 Halite (1.5 cm) on gypsum crystals. B. Kantor collection and photo. Cluster of the post-mining gypsum crystals, size about 15 cm. J. Wachowiak collection. A. Bulicz photo. Close-up of the specimen shown above. J. Wachowiak collection. A. Bulicz photo. Cluster of the post-mining gypsum crystals, size about 10 cm. J. Wachowiak collection. A. Bulicz photo. 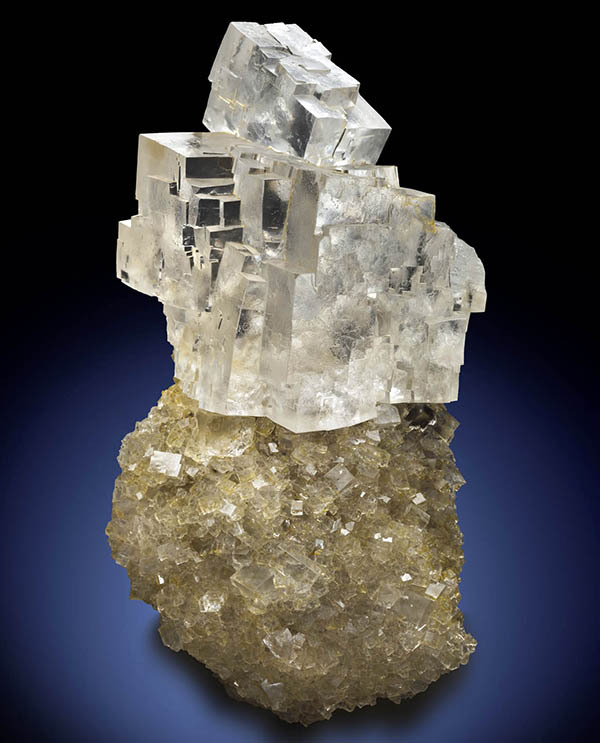 Carnallite also occurred in the Solno mine, as crystals to a few centimeters. The Solno mine was flooded in 1986 (over 30 years ago), and most probably it will never reopen. 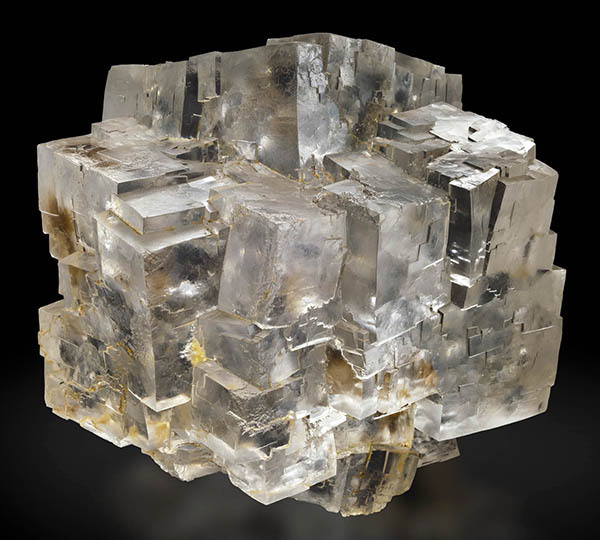 However, because its extraordinary crystal chambers yielded beautiful specimens of halite, it is a significant mineral locality, even though not many people thought about documenting it when it was working, and few specimens from it survive today. 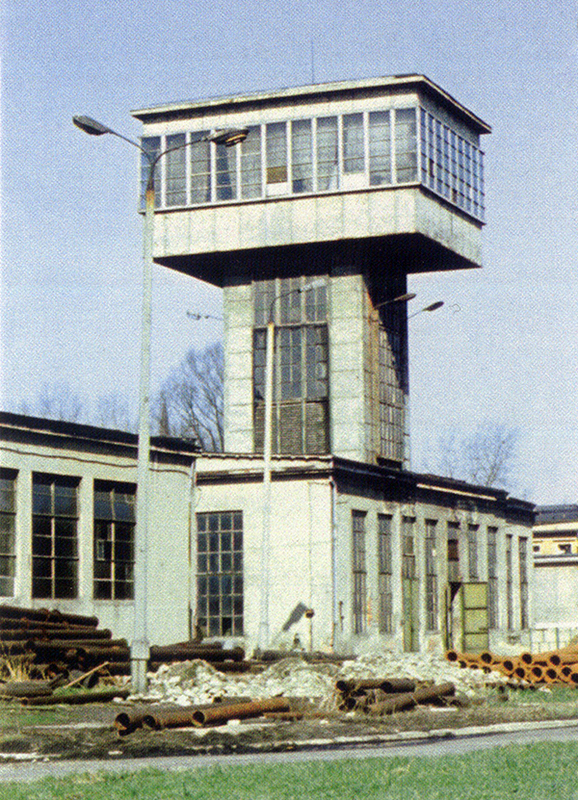 The only remainder of the salt mining industry – graduation tower in Inowrocław. Recent photo. 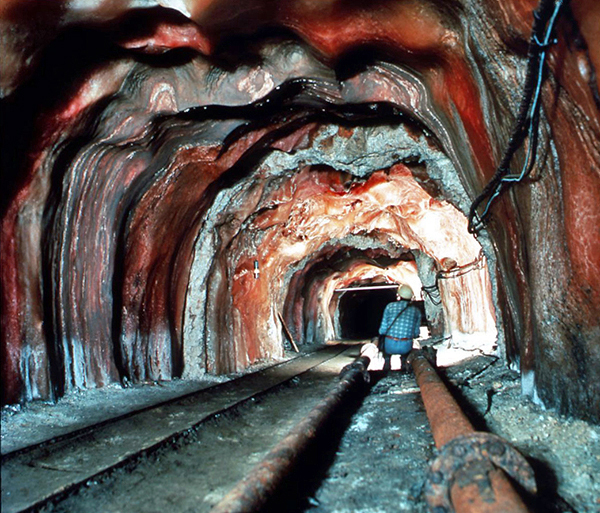 A few dozen photographs taken in the 1980s remain the only evidence of what the mine looked like in its day. Since specimens will probably never again be collected again from the Solno mine, it is important to take special care of those which have survived. In the 1980s I was already quite an advanced mineral collector, taking part in all the main mineralogical events in Poland and in its (former) sister socialist countries. Together with Jola, a student at the University of Science and Technology and at the time not yet my wife, I had been dreaming for a long time of collecting specimens of halite and gypsum from the famous “crystal cave” in the Solno mine at Inowrocław. Of course the most important question was how to get to this halite El Dorado and hunt for the salty treasures. My first visit to the mine took place in 1986, when the mine’s liquidation had just started. I went there with my friend Jacek Wachowiak, who had good contacts in the mine and had been able to get permission for us to enter the workings. Thanks to Jacek I got to know a group of miners who collected specimens in their free time. 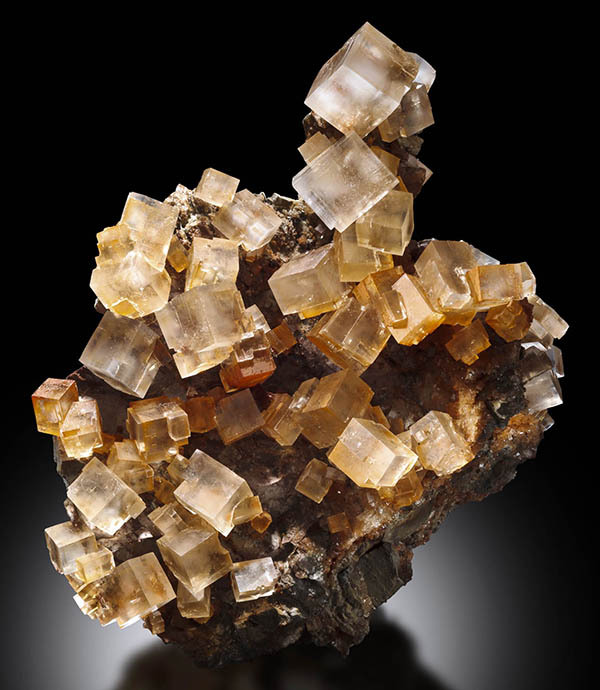 In partly flooded corridors they found beautifully crystallized gypsum ranging from totally colorless to yellow-brown, and diversely colored specimens of post-mining halite. 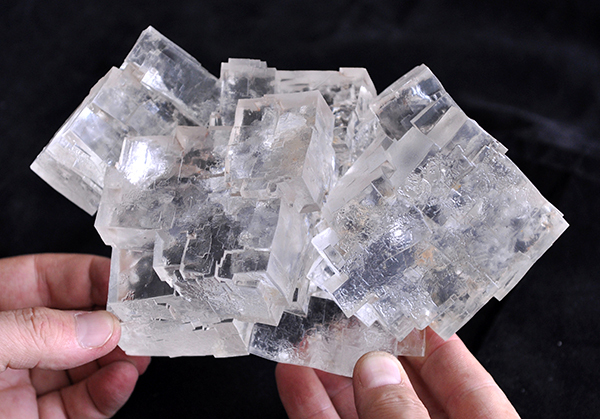 Sometimes the miners also found clusters of gypsum crystals with lustrous cubes of halite resting on top. All of these amazing things occurred mainly on levels VII and VIII of the mine. The fact that the specimens (mainly the gypsums) had to be left in the corridor for a few hours to dry out made it more complicated to get them out of the mine. During our first visit we collected as many specimens as we were able to carry on our own and, with the help of two miners, transport to the elevator and bring out to the surface. I also went for a second time to the mine with Jacek, but I was still thinking of going there with Jola. Finally Jola`s father, who was connected with salt mining and had some contacts in Inowrocław, helped us to arrange the visit: it turned out that this just took one phone call to the main geologist of the mine. Armed with cardboard boxes, tape and a lot of newspapers to pack the specimens, we set off on the night train from Cracow to Inowrocław. At 6 AM we were already in the geology office in the mine, and everything still was going smoothly. We took the lamps and absorbents and received a “guardian angel” – Mr. Tadeusz Szczepańczyk, a mine supervisor – and set off to conquer the mine! Tadeusz turned up to be a great storyteller and a perfect guide to all of the underground nooks and crannies. We learned from him a lot about the history of the mine, and he showed us some of the great places to collect specimens. We had some trouble deciding what and how many specimens we should collect. I already had quite a lot of gypsum from my previous trips with Jacek, so we focused on finding the best specimens of halite, both original and post-mining, that we possibly could. Mr. Szczepańczyk took us to the empty, leached chamber on the IV level where nobody apart from him had ever been. The size of the chamber itself was very impressive: it was about 120 m long, 12 m high, and a couple of dozen to several dozen meters wide! About 50% of its wall space was overgrown by very sharp halite crystals of diverse types; there were crystal clusters on the left side of the chamber, partly at the ceiling and at the end of the chamber. At the very end we saw simple cubic crystals, twisted halite “Christmas trees”, and crystals with gray-white threads in the middle (as in faden quartz). The halite crystals perched on the “rock salt” (or “halitite”) matrix reached sizes to 6 cm. The best specimens had grown on the roof of the chamber, at heights of 3 to 5 m, and the crystals there amazed us by their quality, numbers, and diversity of forms. Our main problem was to find as long a ladder as possible; fortunately we soon managed to find one 4 m long. Collecting these specimens from the roof amounted to a real feast, since we had so many to choose from... during the following two days, Jola and I spent 18 hours in the chamber collecting and packing the best specimens. Thanks to the help of the miners we managed to transport all we had gathered (and it was really a lot) to the surface safely. Then we had to travel alone, with our goods, back to Cracow by train. When we finally got home we were exhausted but also extremely happy in knowing what we had inside all those cardboard boxes filling our flat. 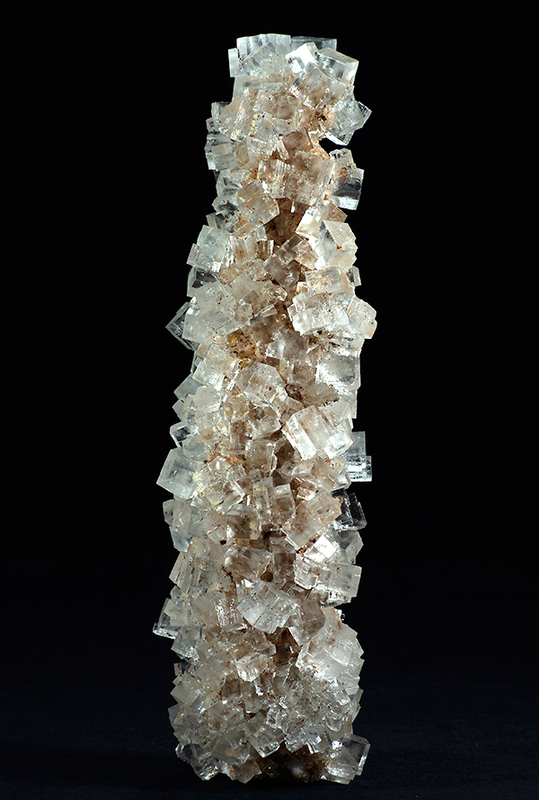 Halite crystal cluster, 45 cm, collected in 1986 by Jacek and Jola Szczerba. J. Gajowniczek photo. 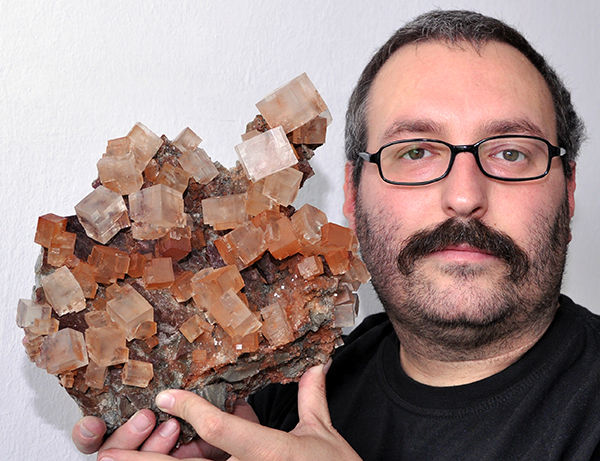 Author of the article with halite crystal cluster colored brown by iron oxides, 30 cm, collected in 1986 by Jacek and Jola Szczerba. Photo teken when specimen resided in Spirifer collection. J. Gajowniczek photo. The same specimen as above in professional photo. 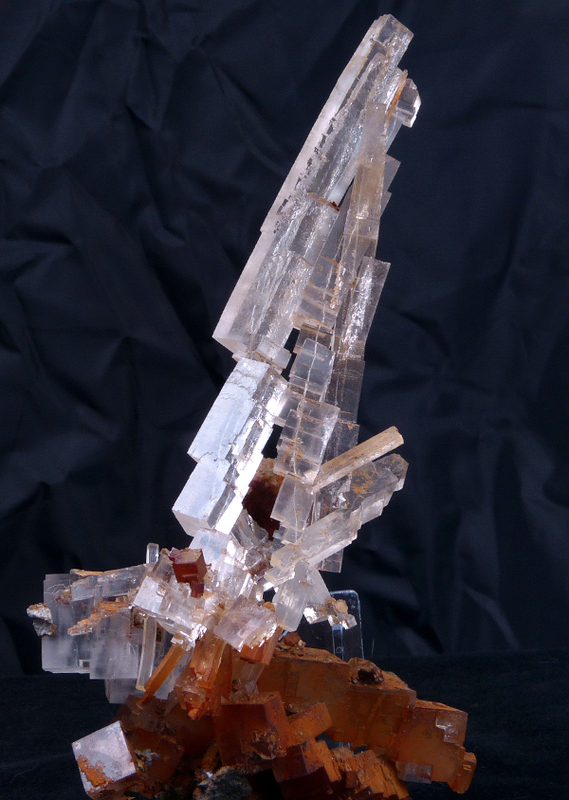 Halite crystal cluster, 30 cm. J. Elliott/FMI photo. 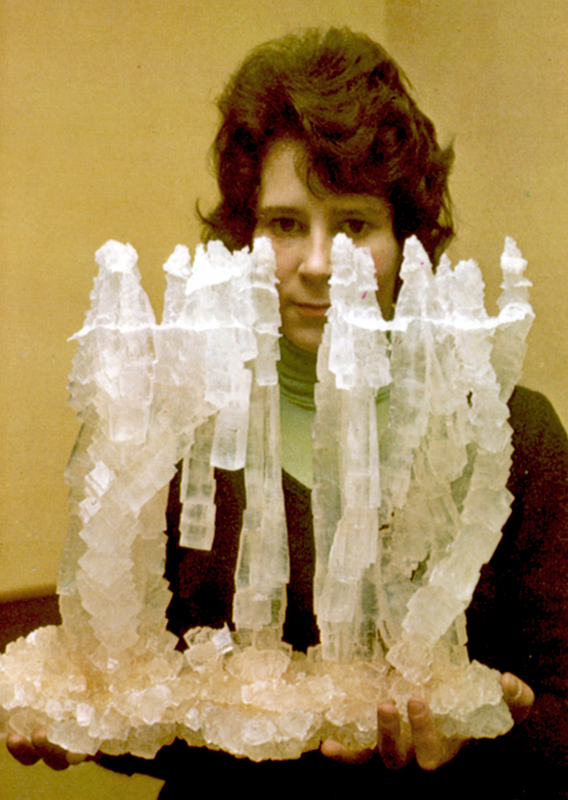 Halite crystals stacked in elongated growths, 15 cm, collected in 1986 by Jacek and Jola Szczerba. J. Elliott/FMI photo. Photos showing large stack of parallel halite cubes, 32 cm. 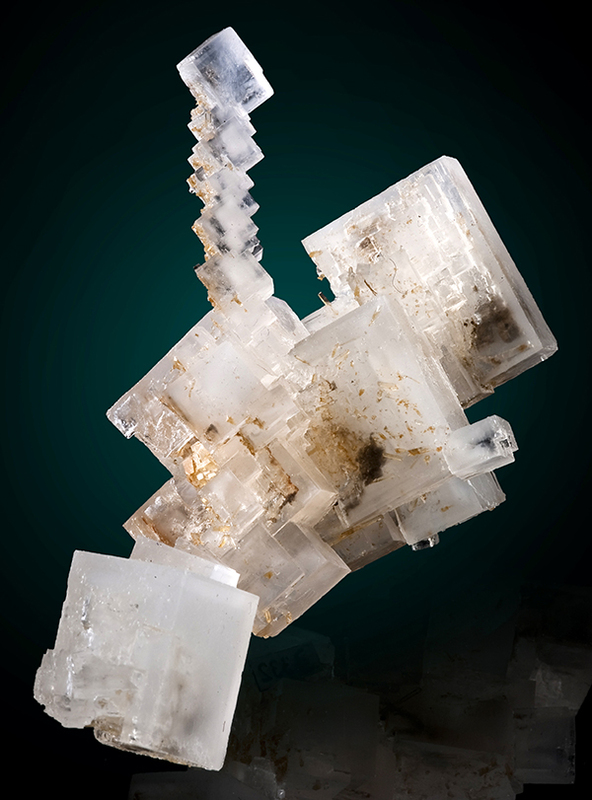 One of the best post-mining halite specimens collected in 1986 by Jacek and Jola Szczerba. J. Gajowniczek and J. Elliott/FMI photos. A few months later, on the same basis, we visited the mine in Inowrocław again. This time our goal was the famous “crystal chamber” on the IX level of the mine. It contained fabulous transparent crystals of halite which glowed in the UV light. Unfortunately we were not the first collectors in that chamber: for a few years a small group of collectors had been visiting the crystal chamber and collecting specimens from it. The only entrance to the cavern was a narrow crack, partly filled with brine, through which we had to crawl for a few meters (fat people had no chances there). When we reached the cavity we saw a fairy-tale scene. The entire ceiling and walls were covered with transparent, intergrown halite crystals to several dozen centimeters on edge! The light from the mining lamps gave a really amazing effect: the crystals looked like shining, blinking stars in the sky. We got down with Jola to extract the specimens and spent 10 hours in the chamber! All easily collectible specimens either were damaged or had already been taken out; we were left with laboriously collecting the ones that remained in the more difficult but still accessible places. We collected a dozen or so very high-quality specimens and a few lower-quality ones. The biggest crystal of halite that we extracted that day measures 35 cm on edge; it came not from the main part of the chamber but from its continuation in the form of a narrow crack on VIII level. Unfortunately this giant crystal was already partly dissolved, its edges and corners rounded by the humid air which circulated in the tunnels. 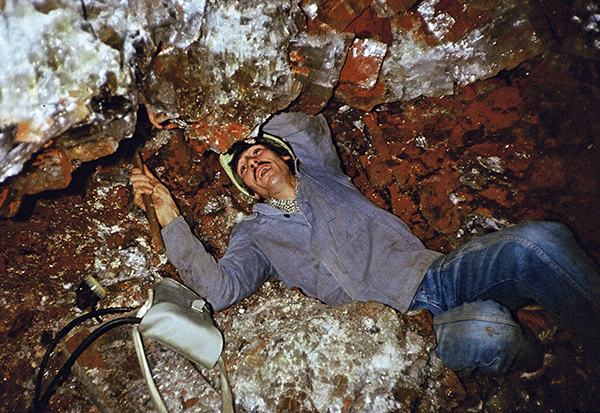 Jacek Wachowiak collecting crystals in the crystal chamber at VIII level. Z. Holzer photo. 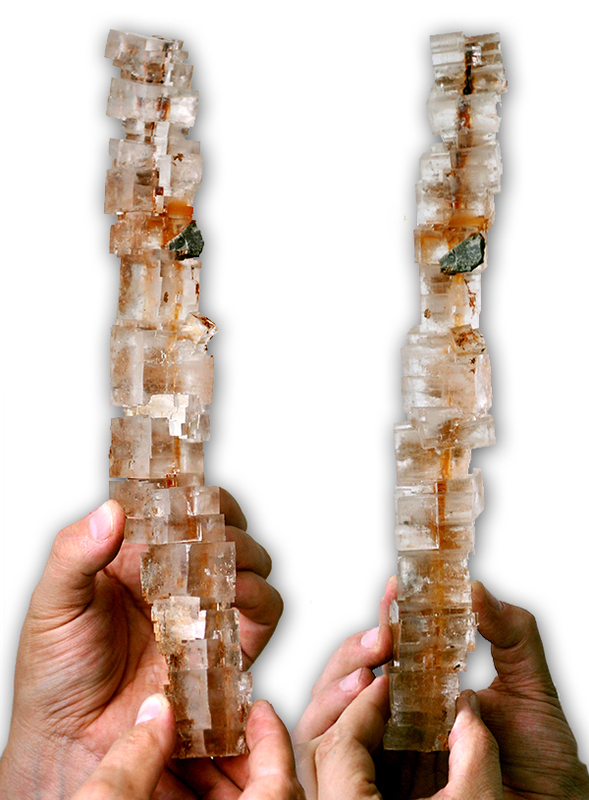 Two photos showing large semi-parallel group of halite crystals, 26 cm. 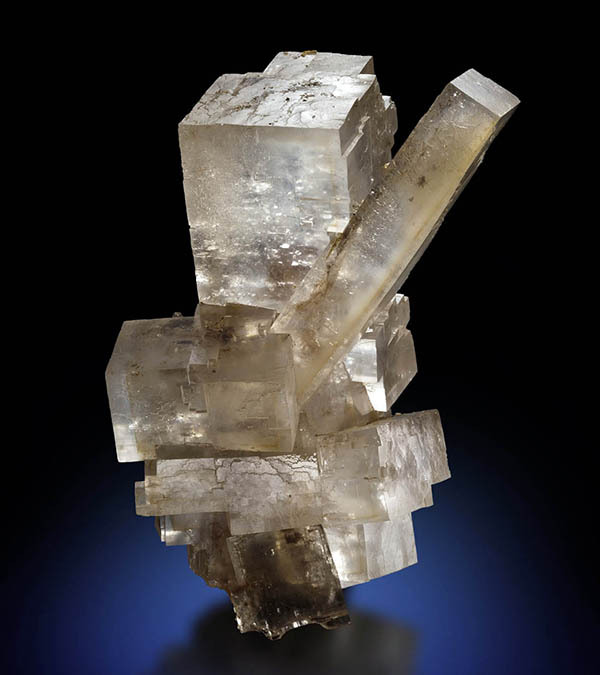 One of the best primary halite specimens collected by Jacek and Jola Szczerba in 1986 in the crystal chamber at VIII level. J. Gajowniczek and J. Elliott/FMI photos. The days that we spent underground in the Solno mine will always stay in our memories as an amazing experience. Author would like to thank to John Rakovan for text review.